Roll & Glow Snail is rated 4.7 out of 5 by 35. Dimension (in) 8.8" x 6.5" x 7"
Rated 5 out of 5 by Melissa C from Adorable, fun and will "grow up" with your child! 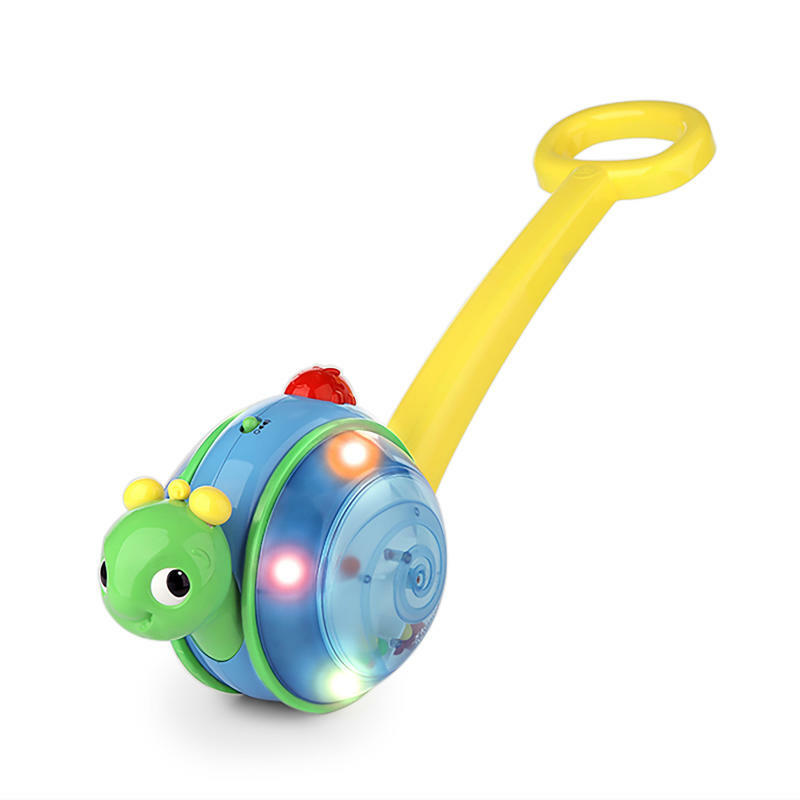 This roll and glow snail is both adorable and perfect for the on-the-go kid! Our little guy is in a phase where he wants to push, pull and grab everything so this toy is amazing to keep him occupied with all the sounds and music AND allow him to push it across the floor. The best part is that there is a handle so that when he is walking, he will still be able to play with it! Rated 5 out of 5 by Bananas from Grows along snail! fun lights, love that it has multiple play options. Rated 5 out of 5 by toddler1 from Great infant to toddler transition toy! The Roll & Go Snail is a perfect toy for babies starting at 6-9 months until around 2 1/2 years. It is a more entertaining updated version of the classic Fisher-Price Corn Popper toy. The fact that you can handle is removeable makes it perfects for pre-walking babies. Once your toddler is walking the handle makes an added fun feature and renewed my toddlers interested in this toy. Additionally, the seemingly endless variety of sounds and tunes the red button on the top plays is surprising and exciting for a toddler that starts recognizing the tunes after repeated play. All around a great learning and developmental toy that will last more than the standard 6 months! Rated 5 out of 5 by Mbbickford from My baby loves it! So glad I got this toy. Before they can walk its great for the music and lights, and once they start walking it's a really fun toy also. Rated 5 out of 5 by TheresaP from Eye Candy From the moment we started playing with it, it was all giggles and fun. It's nice to have options on the volume setting. The lights are low glow which is nice because it doesn't blind you when you are playing. I like that it has moving parts that are attached. When holding it there are a lot of things that bring out the curiosity of my baby. Rated 1 out of 5 by stacycmeek from Easy to use and assemble I love that you can adjust the sound volume and that it was super easy to assemble! Rated 5 out of 5 by Tracey1361 from Roll and Glow Snail I can't put into words how much fun my little guy enjoys his new Roll and Glow Snail. Well, I'm gonna try..... All the lights and sounds really get his attention. He's quickly learned what to do to make things happen. It's been a great learning toy for him I also love the fact that it's not geared toward one gender. My friends daughter (about the same age as my son) enjoys the toy just as much as my little guy. And last but not least, this toy grows with your child. The detachable handle allows your little one to play on the ground with it before they can walk. Then, once they are walking or trying to walk, attach the handle and they can push it it see and hear all the same sights and sounds as before It's great to buy a toy that grows with them instead having to add it to the toy collection that he's grown out of. This little snail is getting plenty of play time.